At the end of the Carboniferous and beginning of the Permian, continental drift caused the final closure of an ocean to the south of Britain. Rocks were pushed up into a vast mountain range that stretched thousands of kilometres to the east and west. This phase of mountain building, known as the Variscan Orogeny, is represented by the major time gap (an unconformity) that occurs between rocks of Carboniferous and Triassic age. It is during this time that the Mendip Hills were folded into their characteristic 'whale back' form. Simplified geological map of the Mendip region showing the concentric outcrop pattern produced by the four main periclinal folds. 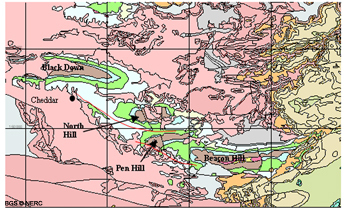 The Devonian Portishead Formation is shown as dark brown, the Triassic rocks are shown as salmon pink. Major thrust faults shown in red. (Click to enlarge). 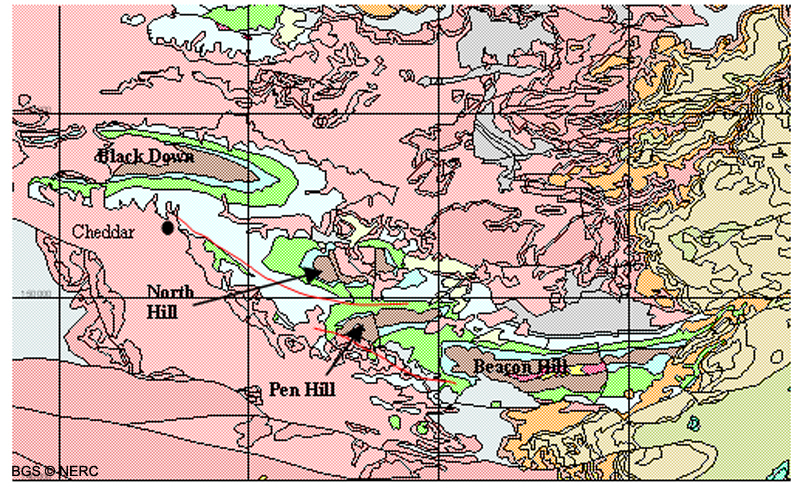 The Mendips were close to the northern limit of mountain building, and probably reached an original altitude of around 1500 m. Although complex in its detail, there are two key features to the geological structure of the Mendips: the folding of the rocks into four approximately east–west orientated upfolds (Blackdown, North Hill, Pen Hill and Beacon Hill) and the development of gently dipping fractures (known as thrust faults) along which major parts of the rock succession have slid across each other. A close relationship probably exists between the thrust faults and the folded rocks of the Mendips. Intense pressures to the south of the British Isles in the Late Carboniferous and Permian caused rocks within the highest few kilometres of the Earth's crust to be pushed northwards over more deeply buried strata. This movement occurred along large, gently dipping thrust faults. The thrusts propagated through the rock from south to north, with rocks at shallow depths sometimes becoming folded ahead of the advancing thrust fault. In this way, the characteristically narrow elongate folds of the Mendip Hills are thought to have formed. All of the folds have steeply dipping or overturned beds on their northern side and more gently dipping beds on their southern flank. Block diagram to illustrate the concentric pattern of older rocks surrounded by younger rocks that has been produced by erosion of the Mendip periclines. The Mendips are an example of anticlinal folds, recognised on geological maps by a concentric outcrop pattern with the oldest rocks at the core. 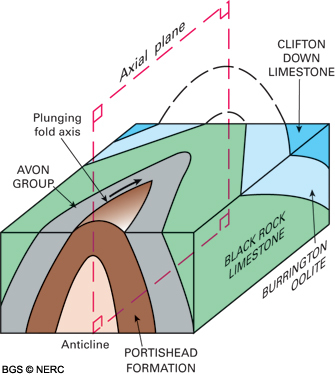 The distinctively shaped variety of anticline that forms each of the Mendip Hills is known as a pericline. Both anticlines and periclines are prone to rapid erosion after their formation because strata are stretched and weakened when they are buckled upwards. This explains why old, deeply buried rocks at the cores of anticlines rapidly become exposed. On Blackdown, erosion probably reached Devonian strata at the core of the anticline by the Late Permian or Early Triassic. Cartoon to show how thrust faults can move older rocks on top of younger rocks. Thrust faults can produce some unexpected geological relationships. They allow older strata to be moved up from depth and be emplaced on top of younger rocks. In some cases, far-travelled slices of thrusted rock can be almost entirely eroded away, leaving small isolated surface outcrops of older rocks on top of younger rocks. This is the explanation for the occurrence of Carboniferous Limestone on top of Coal Measures at Upper Vobster, near Frome. Older thrust faults can also be folded by deformation associated with the development of younger thrust faults.